Congratulations to the winners of the last contest. The autographed ARC of Cara Black's Murder in the Latin Quarter will go to Mindy A. of Bronx, NY. Claude Izner's Murder on the Eiffel Tower will go to Marta H. from Wapakoneta, OH. The books will go out in the mail tomorrow. Since we just hosted The Hot and Cold Mystery Tour at Velma Teague this week, I'm offering the Hot or Cold Contest. I have autographed ARCs of the latest books by both Vicki Delany and Deborah Turrell Atkinson. Pleasing the Dead is the latest Storm Kayama mystery by Debby Atkinson. It's a fascinating book, as Storm tries to help a woman set up a new dive shop, and is caught up in the snares of the Yakuza, the Japanese crime organization. 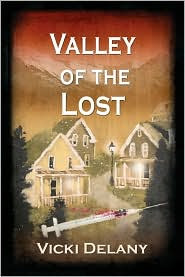 Constable Molly Smith mystery, set in Trafalgar, British Columbia. The mystery combines the best of the traditional mystery with a police procedural. So, do you want Debby Atkinson's hot Pleasing the Dead or Vicki Delany's cold Valley of the Lost? If you'd like to win one, email me at Email me!. If that link doesn't work for you, the email address is: lholstine@yahoo.com. Your subject line should read either Win "Pleasing the Dead" or Win "Valley of the Lost". Your message should include your mailing address. Entrants only in the U.S., please. The contest will end Thursday, March 26 at 6 p.m. PT. Jim will draw the winners at that time. The winners will be notified, and the books will go out in the mail on Friday. Good luck! Very cool, Lesa. I entered for both books. However I've heard great things about Deborah Turrell Atkinson. Thanks, Mel. Good luck! I love ARCs, too. The only thing you miss is the attractive covers.